Postcard of the CCC Camp #952 in Brigham City. 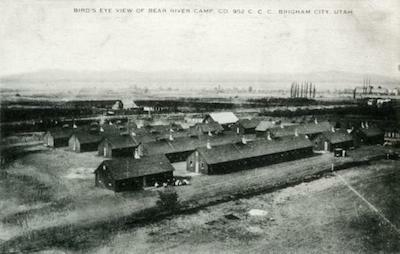 "Bird's Eye View of Bear River Camp Co. 952 C.C.C. Brigham City, Utah." Part of a series of photographs concerning the Civilian Conservation Corps (CCC) #952 in Brigham City, Utah.